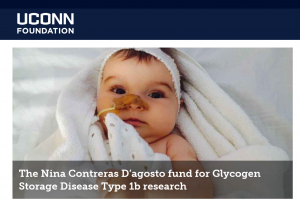 The University of Connecticut creates the Nina Contreras D’Agosto Fund – Nina, the Von Gierke’s warrior! Imagine, such a young baby giving its name to a Fund. I would rather be healthy and not give my name to any fund but given the circumstances I will continue doing my best to keep on moving forward and give hope to all those babies in the same situation. Thanks a lot for everything! The Fund has been given my name but this is a collective achievement from all of us, from Nina and all her warriors, for the benefit of all GSD 1b patients. Once more, we made it! Great news!!!!! One step after the other!!!! Well done to Your parents Nina!!!! Thank you so much Rita! This is all thanks to people with huge hearts, just like yours. Grazie mille cara. Un forte NinAbbraccio. Your great aunt is crying again!! Love you so much Little Great Warrior!!! Forza Nina!!! Thank you so much Aunty!! It is good to cry out of happiness!! 🙂 All this is thanks to you and all the Warriors! Big NinaHug!